A daring CIA agent and a risk-adverse I.T. expert need to combine forces—like it or not. Ryan Carr’s mission is to deliver top secret intel—not guard I.T. expert Haley Nobel, the unsuspecting woman who saved him while he was in a shoot-out. But with bullets flying, Ryan and Haley have no choice except to rely on each other and their survival instincts. 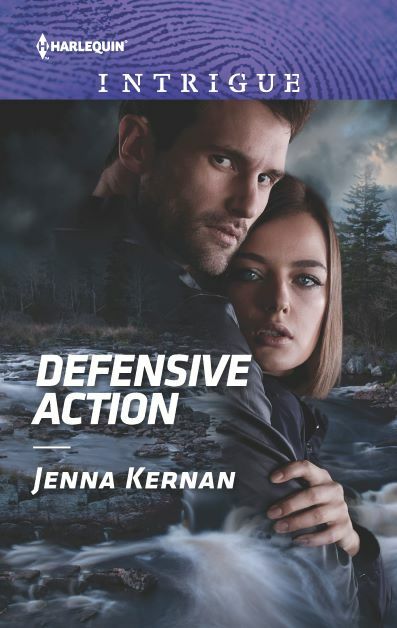 With both of their lives on the line, will they find the best defensive action is total engagement? Haley Nobel muttered to the car’s empty interior. There was no one in the rental with her to answer and she realized it was the first time she had been outside alone, all alone, in years. The GPS app had taken a holiday during her drive in the Adirondack Mountains of New York State and the darkness had fallen like a curtain outside her shadow blue 2018 Ford Taurus. Beyond the windshield there were no twinkling stars. No bright moon. No mystical glimmer of the aurora borealis. Just blackness with the only sign of life being the deer that had darted across the road a few miles back and nearly gave her a heart attack. Adult adventure camp was looking increasingly like the colossal mistake she’d expected it to be. She had about as much business being back here as that deer would have on the Number 7 subway. “Where am I?” she asked the silence about her as she peered at the gas gauge that had dipped below a quarter tank of fuel. She shivered against the chill, trying again to adjust the heat on a night that was forecast to dip into the thirties. She’d forgotten that summer nights were so much colder up here in the mountains. Her light L.L.Bean jacket looked rugged in the catalog but it was designed for wind and rain, not cold. There wasn’t even a fleece liner. Inside one of the front pockets was her impulse buy, offered at check-out for 25 percent off, a Victorinox Rambler pocket knife including scissors, file, two screwdrivers, bottle opener, toothpick, wire stripper, tweezers, key ring and a blade long enough to use to slit her own throat for being stupid enough to let her father convince her to leave her upstairs apartment in the building she owned in Williamsburg, Brooklyn, to redeem his Hanukkah gift to her. She’d been planning the specifics of this week for six months and it was already here. Back in December, she thought her father had a point. She did need to get back out there. But rocketing down zip lines was a little too out there. Besides, her job furnished all the thrills and chills she needed, strictly virtual, of course. She’d tried to get him to take the gift back but he’d said it was nonrefundable and then told her that she needed to stop acting like she was the one who had died. That cut deep, but the more she thought about it, the more she felt he might be right. But perhaps going out with friends for drinks would have been a better start than kayaking in white water. Haley had told her father that her life held plenty of risks, which wasn’t exactly true. Hacking wasn’t dangerous if you were paid by the company you were hacking, which she always was. Her father thought she was paid by local businesses to build websites and manage social media accounts. Her dad also thought she sat alone in her room all day taking customer service calls and playing video games. The video games part was true. But she had adventures in the real world. She’d recently gotten highlights in her light brown hair, which no one noticed as the color she picked was so close to her original shade. You’re not the one who died, Haley. As if she could just flip a switch and make herself like she had been, bring her sister back and go on bumbling along doing stupid stuff as if there would never be any consequences for either of them. She could not go back to that girl, not after losing Maggie. And if that were even possible, it would definitely take longer than one week. But when it came to telling her father she was not going, she just couldn’t do it. Maybe she could stay in a hotel near the camp, take a few photos and send them home. Snagging a video of one of the other female campers as she careened down the zip line would be good, too. Except yesterday dad had pointed out that the camp was technology-free. How had she missed that nugget on the webpage? Maybe her dad was right about having lost her joy. Was joy tied to doing stupid things, like jumping off a forty-foot cliff into freezing cold lake water? What was even the point of that anyway? If anything happened to you, too, it would just kill me. Her mother’s words played in her head along with the declaration that no mother should have to live to see the death of a child—until she had. Haley blew out a breath. When had she started sweating? Dad wanted her back out there. She saw the gift for what it was, a Hail Mary pass, a last-ditch effort to remind her of what she’d put aside. Meanwhile, Mom sent Haley links to articles on tick bites and how to recognize poisonous snakes. What was she doing? Rock-climbing…hiking…canoeing? Bouldering…which, judging from the website photo, was just risking a fall from an unreasonable height onto a bed of broken shards of jagged rock. She was no longer the adventurous one. Not since losing Maggie made her the only one. What got her into the rental car in the first place was the thought of having to hide out all week in hopes that no one would notice she had not gone through with it. Having told her co-workers that she'd be offline and in the mountains, it was now impossible to back out without everyone knowing she had done so. Whose stupid advice was it to declare your intentions publicly? Oh, right, her dad’s again. And she somehow felt that working out at her gym and hiking from Midtown to Lower Manhattan failed to prepare her for hiking along ledges while carrying a pack that would make a Sherpa blanch. The photos of happy, healthy tanned hikers on the singles outing had gotten stuck in her head. She had forgotten the only bugs she managed were virtual and she’d never had a tan in her entire life. Her skin was so white that, under fluorescent lighting, it looked blue. She peered ahead. Were those taillights? She exhaled her relief. She glided closer to the other vehicle. It was a biggish car, like a Cadillac or Mercedes sedan. The plates were from Ontario. The sedan’s brake lights flashed as it slowed at the sharp turn, clearly identified by the road sign of an arrow bent at a ninety-degree angle accompanied by the reduced-speed-warning sign. They’d pulled ahead as she prepared early to make the turn. Then the side door behind the driver of the sedan flew open and she moved her hand to her horn to alert the driver. Something tumbled out onto the road. At first, she thought it was one of those army duffel bags, the really big ones. But then she realized it was something wrapped in an olive-green blanket, rolling along the road. She slammed on her brakes as her mind registered a human form and blood on a pale face. Haley yelped as she judged the distance between the figure on the road and her decelerating auto. Too short, she realized and turned the wheel, swerving and squeezing her eyes shut tight. She braced against the wheel and lifted her shoulders to her ears. Her sharp inhalation merged with the sound of her phone tumbling from the cup holder and into the wheel well at her feet. The Taurus shuddered to a halt as the anti-lock brakes engaged. There had been no thump of tires rolling over a body. She opened her eyes. The car ahead of her continued on, seemingly oblivious. The cones of her headlights showed nothing but dry empty pavement. Had she imagined it? Something thumped against her driver’s door. Haley yelped and glanced out the side window into the face of a man lying on his back inside a blanket that had been secured like a rug with clear tape around his torso and legs. “Jeepers!” she croaked and opened the door, which thumped against the man’s hiking boots. The cab light illuminated a rectangle of pavement on which the man lay. He sat up, struggling with the blanket until he released the tape, compromised in his roll. Then he held up his hands, bound together with silver-gray tape. Duct tape, she realized, the kind her dad had in his tool kit. The blanket fell away from him, revealing his shirtless torso streaked with sweat, grime and blood. Her eyes bulged. Deep brown eyes glittered above the strip of silver duct tape that covered his mouth. For just an instant she thought she might be part of some elaborate practical joke, some “gotcha” reality TV program. But the blood was real and so were the abrasions. He lifted his bound wrists again, insisting. “Yes,” she said and placed the car in Park before spinning in her seat, leaving the car running. What was she doing? He was in danger…so she was in danger. Her new jacket flopped open and something heavy bounced against her hip. The Rambler pocket knife with ten tools, she realized, one of which was a knife blade. She scrambled to kneel at his side and fumbled with the pocket knife, dropping it on the road. When she retrieved it, her hands were shaking so badly, she could not get her thumbnail into the slot designed to be used to retract the blade. He was sitting up now, blood streaming from a cut above his eye as he extended his bound hands, silently asking for the knife. His hands jerked out, adamant. She placed the multi-tool in his cupped palms. He flipped the knife about, flicked open the blade and then tossed the open knife in the air, catching it so that the blade was now up and pointing back toward the tape that secured his wrists. Then he neatly sliced through his bonds. Haley tottered back on her rump at this display of…what. exactly? Pocket knife proficiency. Who was this guy? An instant later, he had the tape off his mouth and had ahold of her upper arm in a grip that said he was both strong and dangerous. “Get in,” he said and shoved her toward the car. Oh, no way, she thought. She heard the sound of tires screeching and glanced up to see red brake lights flare on the big shiny sedan now making an illegal U-turn on the double solid. Headlights now blinded her. What was the greater risk? she wondered, trying vainly to analyze the situation as her heart sped with the wheels of the approaching auto. “What’s happening?” she shouted, hardly recognizing her voice because it was a full octave higher than usual. Broad hands grabbed her rump and shoved, sending her sprawling across the console and into the passenger seat of her rental. She was still face down on the upholstery when he slid under her legs and into the driver’s seat. “Move!” he shouted at her. Instantly, she crumpled herself into a ball and contorting herself like a magician’s assistant until she was kneeling backward on the passenger’s seat. “What are you doing?” she yelled as he threw the car into Drive. The momentum caused by his foot slamming down on the accelerator forced her face into the headrest. A moment later, she spun in place and dropped into the bucket seat. Technically it was a rental, but it sure was her credit card and her signature on the line that said she wanted to buy the optional liability coverage and damage protection, which was voided if she were not the only driver. He didn’t look at her and a moment later she saw why. They were rocketing through the night at the sedan that sped toward them. It was like a joust at the yearly Renaissance Faire, except instead of horses and wooden lances, these contestants were using two-ton automobiles. Their opponent was riding the modern-day equivalent of a warhorse and they were astride a borrowed mule. “Look out!” she hollered, as if he could have missed the oncoming vehicle. “Seat belt,” he said through gritted teeth. She understood and panic flashed cold on her skin. He was going to crash them on purpose. Haley drew the belt across herself with trembling hands and somehow clicked it home. She pressed back into the seat as if the inches she gained would somehow protect her. She glanced at the airbag warning on the dash, afraid she was going to feel the impact firsthand. Her gaze flicked back to the oncoming sedan and she thought she saw someone leaning out the window behind the driver. The stranger beside her grasped her by the neck and forced her head down as if readying her for crash position aboard a doomed 747. She bit her lip and tasted blood as her upper teeth sliced through it. There was a sound like glass breaking and then a cracking noise that reminded her of the sound the ice in an ice cube tray made when you twisted it. Bits of glass rained down upon her. He draped his body over hers as the side window exploded. “Who’s driving?” she yelled, knowing he couldn’t simultaneously drive and lie across her like a fire blanket. He straightened and she did the same. The window before her was now a mosaic of tiny squares of glass. Wind whistled through four holes in the middle of each circular epicenter of disaster. But the sedan was gone. She pressed a hand to her heart, feeling it jackhammer. Turning in her seat, she saw that the driver’s window had folded in half, as if cleaved by an ax. Her side mirror dangled from a series of wires and the sedan was behind them on the shoulder. Her hysterical elation ebbed as the sedan’s red taillights flared. The vehicle moved back onto the road and turned. When she next spoke, she was surprised at the deadpan quality of her voice.